Shingo Araki is a Japanese animation artist and character designer. He developed an interest for drawing at age five. He graduated in Aichi Prefecture. In 1955, at age eighteen, he debuted as a cartoonist in the "Machi" magazine. 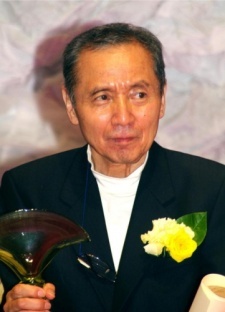 He then joined Mushi Production as animator in 1965 and later founded Studio Jaguar in 1966. In 1970, he debuted as animation director in the Mushi TV Series "Joe of Tomorrow", and later worked on the anime adaptations of several of Go Nagai's manga, including Devilman (1972), Cutie Honey (1973), and UFO Robo Grendizer (1975), serving as a character designer on the latter two. He usually collaborates with animation director Michi Himeno, who he met in 1973. They formed Araki Production in 1975. He worked as animation director in 1978's "Goodbye Battleship Yamato: Warriors of Love". He, with Himeno, has been celebrated for their success. The Araki-Himeno duet collaborated on TV series and animated films such as "Saint Seiya" (1986-89), "Saint Seiya Overture" from 2004. Some of his successes are Majokko Megu-chan (1974), Lupin III (1977), Mugen Kido SSX (Captain Harlock, 1978), Versailles no Bara (Lady Oscar, 1979), Hana no Ko Lunlun (Angel, 1979), Mahou Shoujo Lalabelle (1980), Uchû Densetsu Ulysses 31 (Ulises 31, produced 1980, released 1981), and the versions for OVA of Fuma no Kojirô (1991). International accreditation came with Saint Seiya (Knights of the Zodiac, 1986), for his dynamic drawing style along with the elegant drawings styles of Michi. This Dynamic Duel, as they are known, have been instrumental in the success of the series. Working for Toei Animation and Tokyo Movie Shinshia, Araki was also an animator on several American productions which outsourced animation work to Japan, including Mighty Orbots (1984, key animation), The Adventures of the American Rabbit (1986) and G.I. Joe: The Movie (1987). Passed away on December 1st 2011 due to acute heart failure. He was 72 years old. I'm pretty sure there is a mistake, I highly doubt he made the character designs in YGO DM and GX. First of all it looks nothing like his old style, also the first YGO and DM aren't even by the same company. He probably only worked on the first series and the movie, not the anime by Studio Gallop. a legendary animator. He made Saint Seiya and YuGiO epic. One of the best character designers to ever grace the medium. He was an amazing guy! The first episode I've ever saw from saint seiya was one animated by him which pretty much hooked me up completely when i was child. Thank you for your amazing work. R.I.P. Apparently he was drawing a manga while in retirement (Sourire d'enfance, Childhood Smile? ), if anybody finds any info about it, thanks for adding to the database. This guy took the basic cartoony anime style from Osamu Tezuka and took it to the next level, with all these shadings, details and expressive eyes.